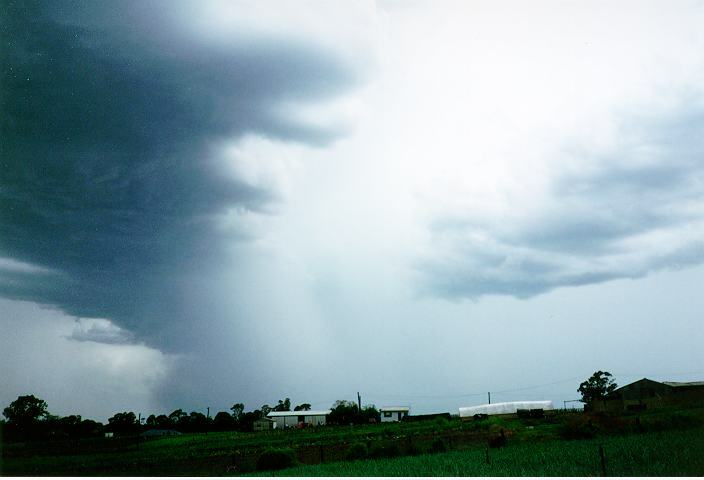 The conditions associated with storms on the 19th were maintained through to the 20th. A trough was responsible for the storms on the 19th with no clearing edge such as those associated with trough lines or cold fronts. Therefore, storms were again expected to develop during the afternoon. 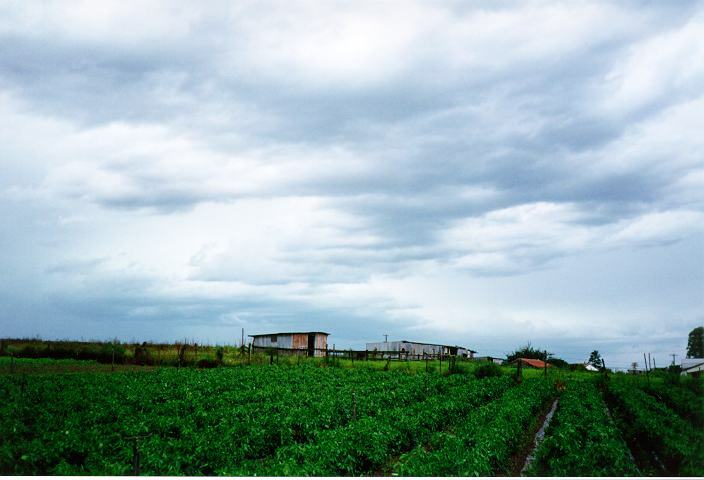 The morning produced weak dissipating cumulonimbus as well as scattered cirrus and altocumulus. This decreased somewhat during the day allowing the temperature to rise to the mid-30's. At 3pm, large widespread cumulus began to develop from the northwest (Again!!!). Between 4-5pm, there were many locally, intense storm cells scattered across the west and northwestern suburbs. The Bureau therefore sent out a severe storm advice for the metropolitan area. There were at least three separate cells surrounding Schofields: one to the southwest, one to the northwest around Richmond, and one to the north near Oakville. 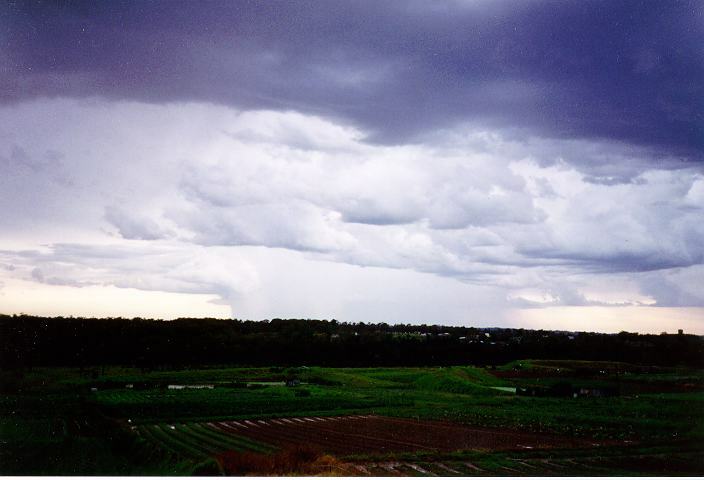 The precipitation cascade of the Oakville storm was oriented east-west and the direction of the falling precipitation was slanted to the west. This gave me the impression it should miss Schofields. 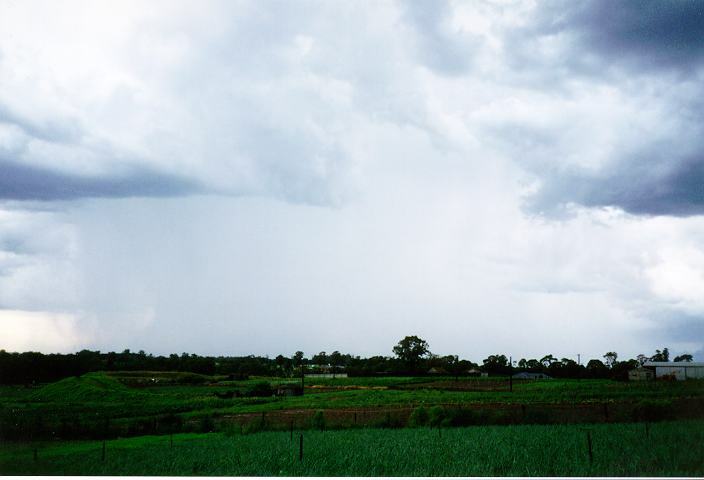 However, this storm began to develop so rapidly on its southern edge that it was now in a position to strike the Riverstone Schofields area. Consequently, I focused on the boundary where the precipitation met the ground. Finally, a "white wall of precipitation" gradually began to invade and hide the foreground about half a kilometre away. The lull in the wind was replaced by a sudden blast of squall gusts consisting of hail to 1cm and violent rain. 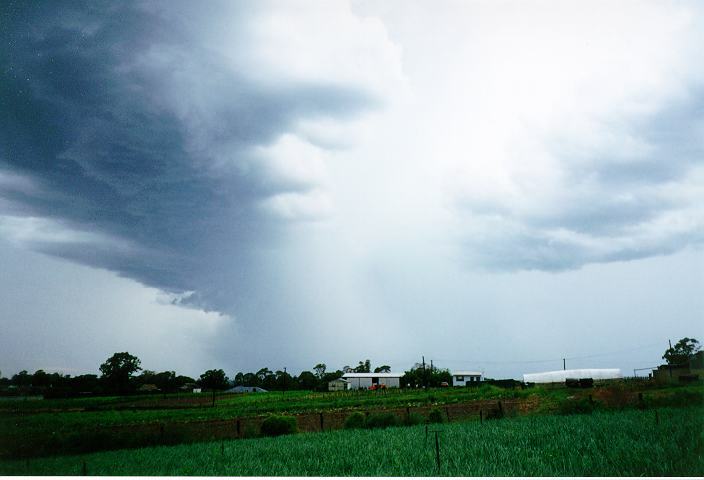 In fact, the rain and hail was virtually being swept horizontally from the NNW. Blackouts occurred almost simultaneously with the squall. After phoning in the situation to the Bureau, the severe storm advice was upgraded to a severe storm warning. The wind during the storm veered slightly from the northwest to the north. The storm lasted about 5 minutes with relatively weak downdraughts from another cell developing at the rear of the main cell. Some heavy rain also fell from this second cell. It was not until we went outside that we came to our senses. Everybody seemed to be in a state of shock probably because the storm was unexpected by most as well as sudden. I observed that several objects of reasonable size had been blown up to a distance of 30 metres. Several medium sized branches of our two weeping willow trees were snapped off and scattered up to a distance of 5-10 metres from the trees. Somebody then drew my attention to a tree a few farm blocks down the road. Another weeping willow had been uprooted, partially damaging an agricultural greenhouse. It was lucky the wind was not from the north as the tree would have fallen onto the house. There were other reports of uprooted trees in Schofields and Riverstone as a result of this storm. I later found out that a wooden fence had been flattened across the road as well as a large fruit tree. This storm headed towards the southeast. However, another storm developed over the Plumpton area to the west of this cell and intensified. It caused damage in areas from Seven Hills to the North Shore with an unverified report of a funnel cloud. Damage was extensive although some trees suffered more than others. It is important to note that rain from the previous evening may have slightly softened the soil. However, due to the amount of damage that occurred in a storm with such short duration, I believe winds in Schofields topped 100km/hr. Over $2 million in damage is expected to be the payout from the severe storms in the Metropolitan area. 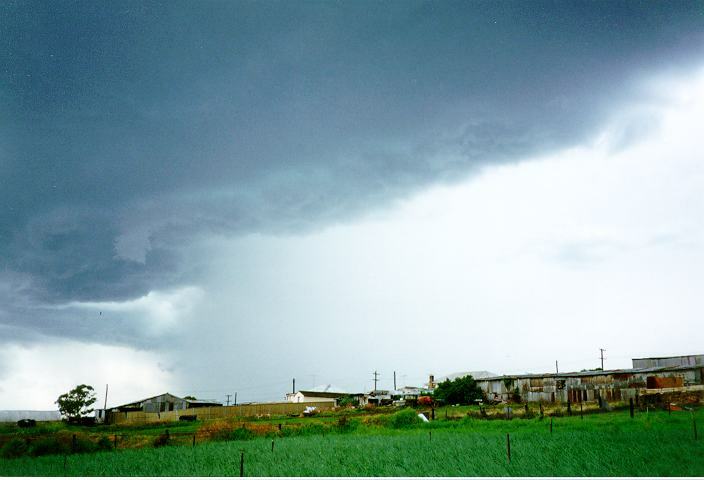 Worst affected was the lower North Shore where a tornado may have occurred. Damage to large trees and property was most severe there. Across the suburbs, over 50 homes were damaged by falling trees and severe gusts. Blackouts occurred and telephone lines were cut at various locations. Trains were delayed for hours on the North Shore line when large trees fell across tracks. At Riverstone 6 homes were damaged, with trees blocking Garfield Rd, at Holroyd 7 homes damaged, Auburn 12, and Parramatta 6. 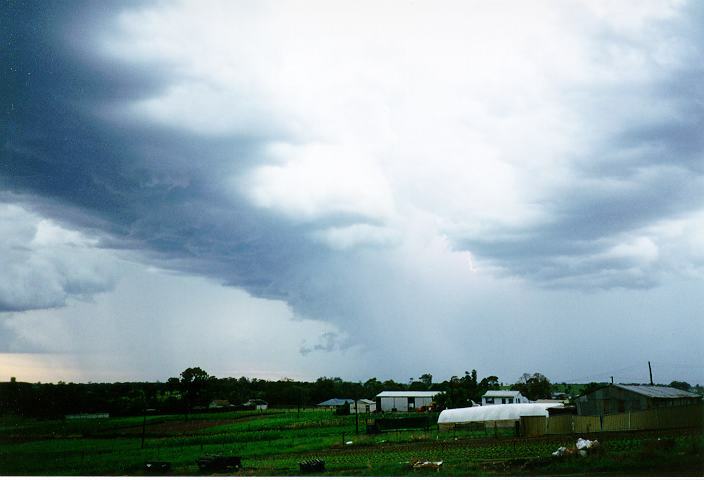 19:00 20/01/96 GOOLMA CT 90kt gust, 20mm in 7 mins. Roofs off some buildings and trees down. 19:25 20/01/96 Fort Denison MET 59kt gust. Wind gusts estimated in excess of 48 kt at Schofields with trees blown down and some uprooted. A sighting of a funnel cloud taking out tops of trees was reported from the St Leonards area at around 19:15.